Experience a new sense of style and comfort at the Sheraton Hartford South Hotel, just off Interstate 91. We are close to the impressive Dinosaur State Park and Arboretum, golf courses, and shopping venues. Many corporate headquarters and national insurance companies are located downtown, as are the Bushnell Memorial Theater, the Wadsworth Atheneum Museum of Art, and the Old State House. Settle in for a restful night on the plush Sheraton Sweet Sleeper™ Bed in any of our spacious guest rooms. A host of modern conveniences will help you feel at home, including a flat screen television and wired and wireless High Speed Internet Access. Upgrade to a Sheraton Club Room to enjoy additional amenities and Club Lounge access. Work out in the fitness center. Swim laps in the indoor pool and relax in the whirlpool. Gather with family, friends, or colleagues in the casual atmosphere of American Grille & Lounge. 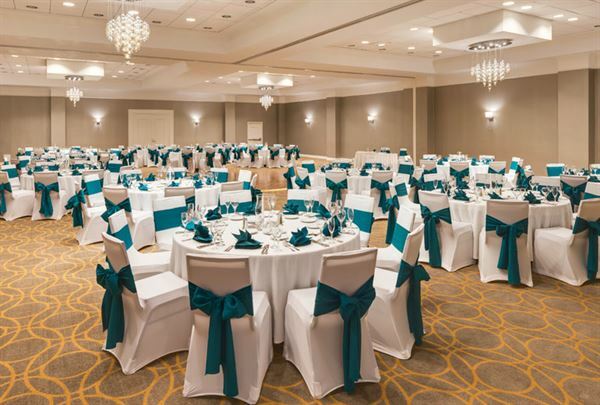 From corporate meetings to social events, the Sheraton Hartford South Hotel has more than 8,600 square feet of flexible function space. Our experienced planning and catering teams will work with you every step of the way. Young Adult Menu - $35/person Package includes: Hors d'oeuvres Buffet 5 Hours of Soft Drinks and "Mock tails" For a full list of options please visit our website.